I first heard of Elna Baker on the Moth podcast which, if you've never listened to it, you should try it out, and prepare for ugly crying on the subway. 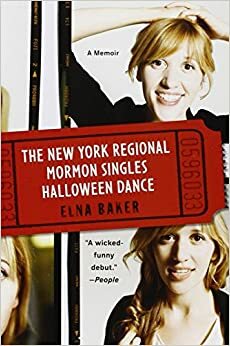 On the Moth, Baker told an abridged version a story from her memoir - a book that deals mostly with her life in New York, trying to date as an overweight twenty-something, and a Mormon. The title alludes to an annual event in the Mormon community to which Baker returns year after year like a recurring nightmare, or a gym membership. If you're looking to try a memoir on for size but aren't quite ready for the episodic sexcapades of Isaac Oliver, this book might work for you. Baker is a lovely storyteller, which is why I finally picked up the book. She speaks very plainly and genuinely from the heart on every subject - from being the "funny" sibling, to battling her religious roots, to nearly ODing on diet pills. Her frank portrayal of modern Mormonism isn't fully fleshed out - she seems, as of 2009, to still have been battling with her own beliefs and as a result, reading it can sometimes feel like watching shadow puppets while the real players hide behind the curtain. I am self-confessed ignoramus when it comes to most religions, but probably most especially Mormonism. I often accidentally confuse it with the Mennonites - not because I'm stupid or purposely ignorant or anything, but probably because of the clothes. I just get confused. Those bonnets throw me off. After reading Baker's memoir, I can't confess to being much the wiser on the subject. But beyond that, I did get the sister-in-arms feeling that I think she was going for. Being single in this city is certainly daunting, and being an outsider in one way or another intensifies that feeling. Baker's story provides more insight than hope on that subject, perhaps an effect of writing a memoir so early in life, before the arc could be fully formed. Her writing is sweet and bubbly, and the kind of thing that I wish I'd been able to read when I was starting out in New York. As a mostly-jaded established New Yorker now, it's a little flat.